Yes, it is November 1st and we are getting into gear for Christmas (finally). 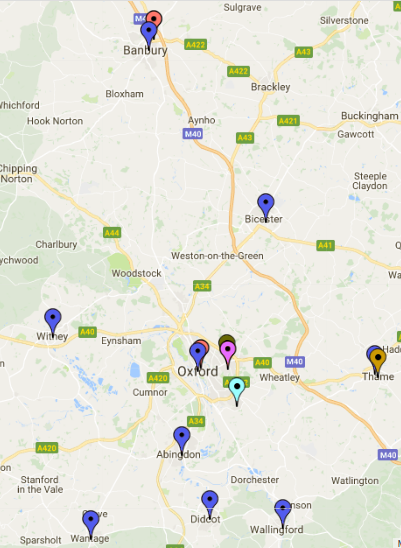 This year, we are fortunate to have collection sites across Oxfordshire, so click on the link on the left that says 'Collection Sites' for a map that will give you the details of the site nearest to you. Unless stated otherwise, all the collection points will be open from the 1st to 30th November, and we will accept collections/packed boxes up to Thursday 7th December. This will give us a chance to get it all sorted and delivered to the recipients before Christmas. We will also be holding various packing parties in Oxford during November and the first 10 days of December, details and dates here. If you can't stay to one of these events and just want to drop off donations, that is fine. And if you can only come for an hour that is grand also. The more help the merrier! We have updated our promotional materials, see the 'Useful documents' page for pdfs for you to download / print and use. These will include guidelines to what goes into a box if you want to do your own. For people who want to have a packing party of their own we'll also be publishing our tips for holding one of these later in the month (available after November 15!). 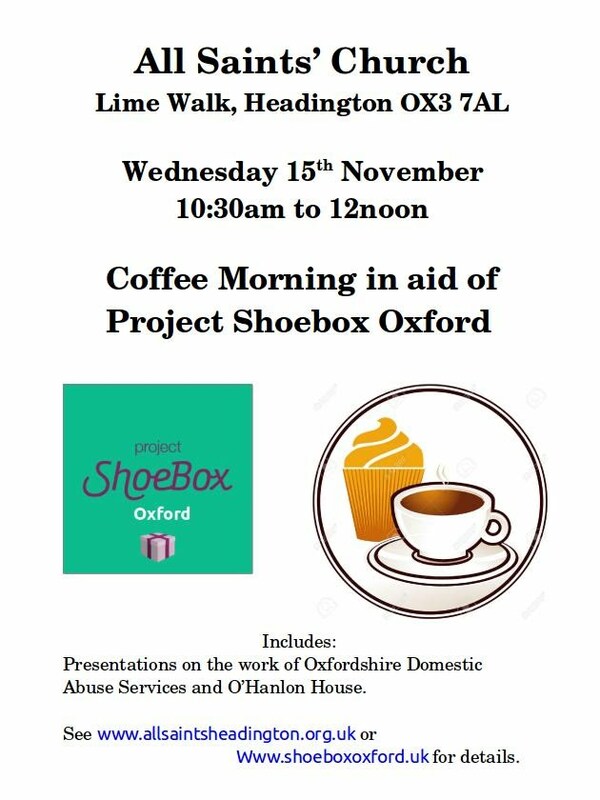 Finally, on Wednesday 15 November, All Saints' in Headington are holding a Coffee morning, with proceeds supporting the work of Project Shoebox Oxford. Come along, drink some nice coffee, eat luscious cake, and hear about the work of Oxfordshire Domestic Abuse Services and O'Hanlon House. ...because we can't do what we do without you! A New Year Sort out - Thursday 25th January, 6:30pm at All Saints Church House, New High Street, Headington. Yes, it is after Christmas but we still have donations that we weren't able to sort out before then .. so we'll just be getting together to find out what we have got, possibly wrapping boxes with sparkly paper but generally having a fun time! So anyone who wants to join us will be more that welcome to come along and help. If you can't stay and just want to drop off donations that you weren't able to give us before Christmas, that is fine. And if you can only come for an hour that is grand also. The more help the merrier. We'll have some refreshments (eg tea, coffee, biscuits, I may even bake a cake) to keep us fortified for the task! All Saints Church House is in the same road as the house with the shark coming out of its roof. There will be a notice on the front door stating that this is where the party is! For those people driving, there is some parking on New High Street, which is part of a one way system. The postcode, for anyone using a sat nav, is OX3 7AL. 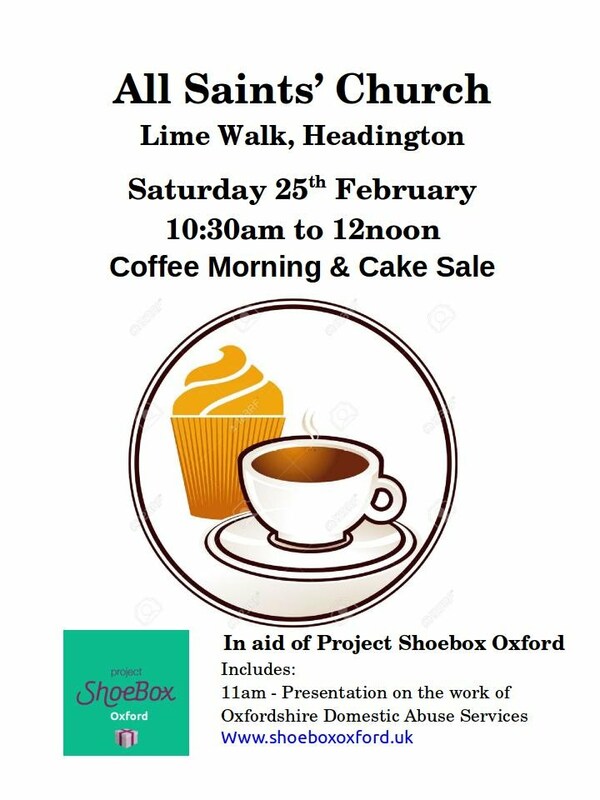 Then, Coffee Morning and Cake Sale - Saturday 25th February, 10:30am to 12noon, at All Saints Church, Lime Walk, Headington. Together with All Saints Church we are holding a fund-raising coffee morning and cake sale. What better way to spend a Saturday morning than sipping coffee with friendly people and eating cake?! (Cakes will also be available to buy.) There will be a speaker from Oxfordshire Domestic Abuse Services to give a short talk about the work that they do. There is no admission charge for this event, but if you want to bring a toiletry or food item (unopened and unused) please feel free to do so. Donations of cakes also welcome. Please click here for a poster to advertise this event. In any one month, there are over 90 women and 40 children (including teenagers) living in an Oxfordshire domestic abuse refuge. Some may stay for a few days before moving on, others can be there for months. Project Shoebox Oxford aims to give them a bit of kindness with a gift of essential toiletries and food, enabling them to start again. Some women are able to make a planned withdrawal from an abusive situation and pack a bag. Others may arrive at refuge with just the clothes they stand up in. Over the holidays when food banks tend to be closed, the packs are essential. For some women, who are not able to access public funds due to their visa situation, the food packs are a vital part of their survival. Our aim is to be able to give Oxfordshire Domestic Abuse Services (ODAS) at least 120 boxes for women and 60 for children this December. Giving them a gift of the essentials helps them cope with their situation, also it helps the workers with ODAS concentrate on building a rapport with the woman and her family straight away rather than worrying about how to meet their physical needs. Any extra items we get are distributed to homeless women in Simon House, or refugees via Asylum Welcome. This year has seen an increase in the number of people accessing both charities, and is unlikely to change soon. So all we ask is something simple, buy an extra toiletry or food item when you do a weekly shop and help us build a box of hope. If you are able to get together with friends or work colleagues to put a box together, that would be very welcome but is not an expectation. We appreciate any items that we are able to use for the gift packs. This is all run by volunteers on a lot of love, kindness and sympathy for those in Oxfordshire for whom life is not good. Shoebox Oxford – because we can’t do what we do without you. We are delighted to announce that we have several collection points set up for this year, and will let you know of any more as they come forward. We are collecting donations during the month of November, to allow adequate time for sorting and packing of boxes during the first week of December. Last year it all got a bit frantic at what can be a very busy time of year for people. Shop hours are 9:30am to 5:30pm, Monday to Saturday. * NB: Please, do not leave donations outside the shop when it is closed! Donations can be left in the porch at any time. Storagebase in Banbury have agreed to host a donation point for us during the month of November. Their opening hours are 8am to 6pm. Please contact them for further details if you are in the area. Phone 01295 221 122. Thame Therapy Clinic are kindly hosting another donation point for us during the month of November. Their opening hours are 9am to 6:30pm. Please contact them for further details if you are in the area. Phone 01844 215555. We are very grateful to friends at The Windmill, All Saints, Hertford College, Thame Therapy Clinic, and Storagebase Self Storage Banbury for their help with this project. Well if, like me, you shop online please don't forget that you can help Project Shoebox Oxford while you shop! It's true! If you shop with Amazon, Tesco, Sainsbury’s, M&S, John Lewis, or Argos online you can raise money for Project Shoebox Oxford whenever you shop with them and 3000 other stores by using our fundraising website, easyfundraising. It won’t cost you a penny more and everything you buy will raise money for Project Shoebox Oxford.